While it is almost certain you will have a memorable time in Machu Picchu, your visit should not just be a quick tour to see the ruins, snap a few stunning pictures, and then leave. Machu Picchu is one of those versatile ruins that offer much more than a glimpse back to the Inca’s history and their marvelous architecture. Here are some of the things you can do to enhance your visit that go beyond the typical two-hour tour. You will have to wake up around 4am, the latest, to be able to queue in line for the first buses that depart to Machu Picchu from Aguas Calientes. If you’re able to take one of the first buses, you will be at Machu Picchu early enough to watch the first rays of light as they hit and illuminate the ruins from the most sacred and highest point to the least, displacing the shadows like a soft blanket sliding down the mountains. This experience alone is a great way to start your day in these mystical ruins. Find some solitude and “connect” with the ruins and the environment around you; or at least enjoy them on your own for a while and at your own pace. Tours are great to get the historical knowledge and facts, but the time you make by yourself will serve you better to admire the details, enjoy the different spaces, and relax in the stunning scenery. I loved taking my time sitting on the upper agricultural terraces where I had an overall view of the ruins and Wayna Picchu. Complete relaxation. What can I say, I love Llamas! There are dozens of llamas roaming in and around the ruins. Don’t be afraid to get close to them, they are friendly and used to be around people, so feel free to pet them and snap a few pictures with them. This is the tall sharp mountain that stands tall right next to Machu Picchu. Daily, only 400 visitors are allowed to hike up to the ancient observatory on the top of Wayna Picchu, so if you’re into catching this unique vantage point of Machu Picchu, you should try to climb it as early as possible. This is definitely an adventurous task, as climbing to the top demands a lot of physical activity since it is really steep (your legs will fell the burn) and narrow, but it is all worth it! Talk about culture with an adrenaline touch! This is also a good way to add adrenaline to your visit to Machu Picchu, but it is less strenuous than Wayna Picchu. Still, you will be walking along narrow paths with 1,900ft drops on one side and no handrails. The Inca Bridge is a narrow path along the side of the mountain that is half carved and half built, leading to an actual bridge 20ft long. The bridge was made out of tree trunks and easily discarded to cut access to the ruins. The Sun Gate, the culmination of the Inca Trail, is a pass between the mountains where Inca Trail hikers get the chance to see Machu Picchu for the first time as the sun rises and illuminates the ruins. If you’re not doing the Inca Trail, you can hike up to Intipunku at any time of the day to get a glimpse of the ruins from a completely different perspective. The view is astonishing, quiet, and peaceful. In my opinion, this is overall the best way to get the most out of your visit to Machu Picchu. Not only is the hike a 4-day adventure, but it is also the prelude to what you’ll see and experience at Machu Picchu, the jewel of the crown. 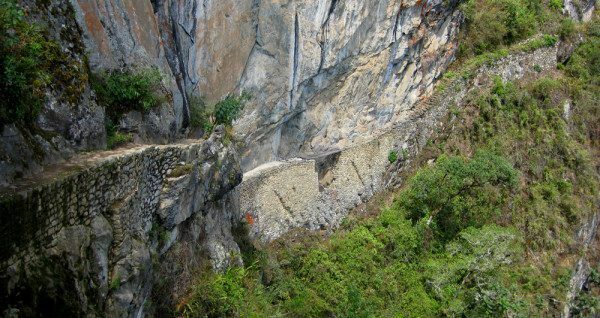 The trail is full of ruins and interesting sights, as it was used by the Incas to access Machu Picchu and other important places throughout the Andes. And let’s not forget about the natural scenery, which is one of the most stunning and impressive things about the trails. I believe doing the Inca Trail gives you a better appreciation of your time at Machu Picchu. It is the prize you deserve after all the physical effort! Have you gone to Machu Picchu? What other ways you recommend experiencing these ruins? I leave for Peru in one month from tomorrow and ohmigod, I can’t wait! And yay Llamas! So cute! So cool, Rebecca!! You’re going to have a wonderful time in Peru as there are so many beautiful places to visit all throughout the country. Are you going to Machu Picchu? I have long wanted to do this Norbert, and last week we looked at Galapagos and Machu Pichu. But with only 4 weeks to spare over New Year we have had to forego this and concentrate on Galapagos and Ecuador. First time for us to South America but I sense we are going to be hooked and will one day finally do MP. BTW did you really do all those hikes? Really pushing yourself at that altitude? Hey Jim! I’m glad to hear you’re going to South America! I believe you’re going to love it and will want to go back. I haven’t been to Galapagos or Ecuador, but people day it’s beautiful. I did all those hikes! Did the Inca Trail, ending at Intipunku… then Inca Trail hikers have to do the short hike from Intipunku to Machu Picchu. The Inca Bridge hike is more leisurely as it is mostly flat, but the paths are narrow and dangerous if you don’t pay attention where you’re stepping. 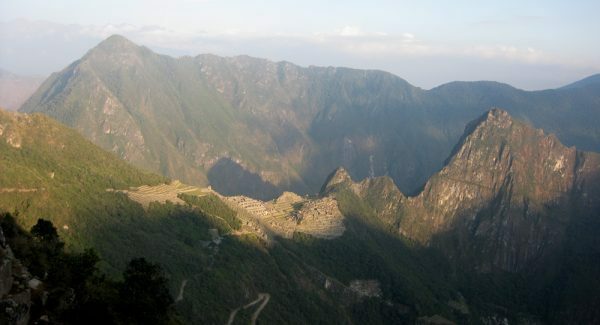 The most strenuous (apart from the Inca Trail) is Wayna Picchu as it is almost like climbing. Wow you’re a toughie! We’ve been to 3,700 metres but not sure how that height would affect us. God forgive me and don’t let my wife see that…should read 40th! Ha! Let’s hope she doesn’t read that! 😉 Galapagos looks like a great 40th anniversary celebration! You’re right, high altitude hiking and anniversary are not the best match (for most people at least). Great ideas for Machu Picchu! Good to get people thinking beyond the ruins to experience more of the area. Since my sister in law is from Peru, I hope I will be able to do these one day! Can’t wait to hike the Inca trail. Peru seems to fascinate me and I can’t wait to get there. Great tips. 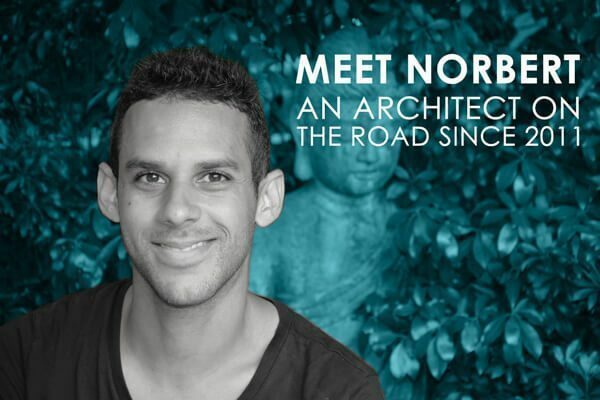 Norbert- Great post!! I hope Bob and I make it down there soon… and when we do, I want to do it exactly like you say to! Sounds perfect! Yes! GO!! 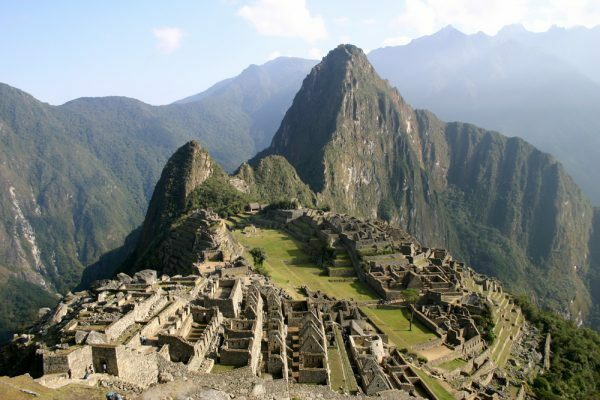 While there, do those shorts hikes, or even the Inca Trail, as they are a great plus to the ruins. 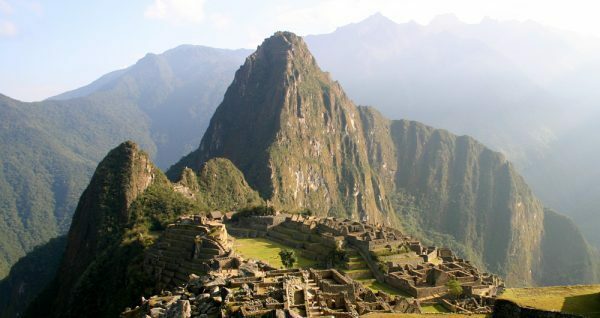 we are deciding whether or not we are going to – once and for all – make our way to Machu Picchu in 2012. We will certainly be drawing on your expertise. I totally skipped Wayna Picchu because I was afraid of heights and was too lazy to climb. I did however lay down on the grass and soaked up the sun. My friend and I started cloud watching. The view of the mountains and the ruins were a great backdrop. I was in Peru last summer and had a great time! I opted to take the train up to Machu Picchu instead of doing the hike and I still had a great experience. 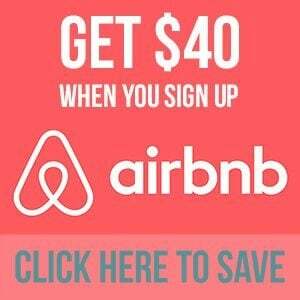 If anyone is thinking about going but hesitant about the hike, don’t worry, either way you will be rewarded. I agree, either way is rewarding. The ruins have so much to offer that anyone can have a great experience there, with or without the hike. Great tips for making the most out of a legendary site. I really want to go to Machu Picchu and would definitely do the trek, I think it would make me appreciate more so than if I just took the bus. Great tips. I agree with you, Laurel. Doing the trek does help you appreciate the ruins more since it is a longer experience, overall, and you get introduced to the Inca architecture, culture, and other info, while doing the hike; so you get to Machu Picchu with some background information that will help you understand things better. I haven’t been to Machu Picchu yet. A friend of mine did the trail in March or April and after seeing his pictures and hearing the stories this was moved up on the list! Great suggestions. It’s so easy to get inspired to go to Machu Picchu by seeing other travelers and friends’ pictures. The ruins have this “magical” feeling that attracts you. Wow, magical is the word for sure, what great sights. And I definitely want a picture with llamas. Haha! 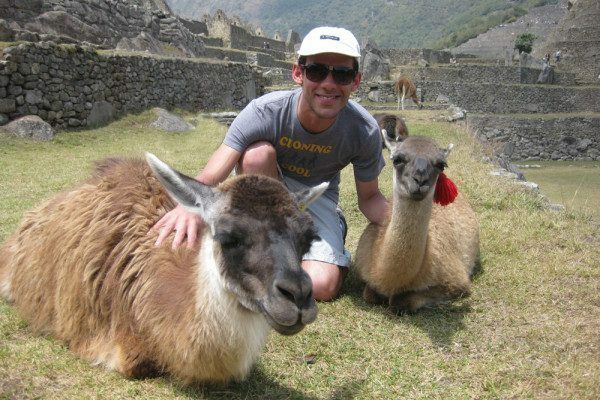 A picture with the Llamas… that was one of the things high up on my list of things to do while at Machu Picchu! I love Llamas! Great pictures and LOVE you with the Llamas!! Thanks Charu! Actually, that is one of my favorite pics of the whole trip. It was actually a dream of mine to take a pic with a llama! Great tips – we did the Inca Trail this year; I also suggest checking out some of the other trails that lead to Machu Picchu for a completely different experience. Thanks Andrea! Actually yes, the other treks are really good too as they show a different scenery in the Andes. Actually, the post I’m publishing tomorrow links to a post by Globetrooper that gives the pros and cons of the different treks to Machu Picchu. It looks like those llamas love you, too! 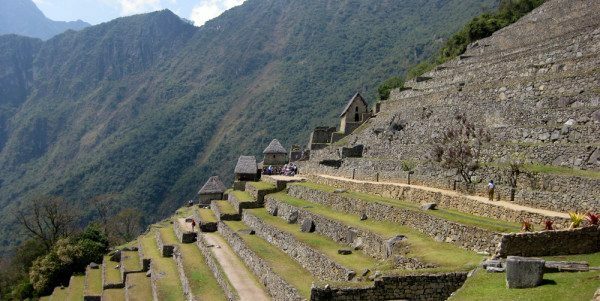 Great ideas for really getting the most out of Machu Picchu. I haven’t been there yet — really itching to go! I can totally see wanting to sit for a while on one of the terraces and just try to soak in all in. haha! Those llamas were really friendly! Oh yes, sitting at the terraces is a great way to soak it all in and admire everything. I recommend everyone who goes there to just take their time and go slow through the ruins. Some really great advice. I am particularly intrigued with mingling with the llamas and hiking to the Inca Bridge. Yes, spend some time with the llamas! They are fun and easy going. 🙂 The inca bridge is cool too! Ahhhh your blog has been the most useful out of all of my research! I will be starting my travels to Peru for 3 months!!! I cannot wait! Defiantly waking up for the sunrise! What hikes that you suggested more of day hikes? Secondly, did you speak spanish when you were there?? Sorry for my late reply. The other hikes vary from a day hike to a few days. I did speak Spanish there, but many of them do speak a bit of English.